Sorry... the 2017 Toyota Avalon Hybrid is no longer being sold as new. 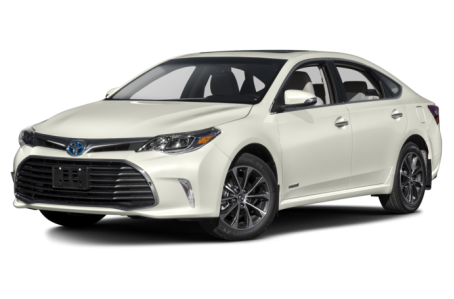 Instead, take the first step to a great deal on 2019 Toyota Avalon Hybrid with a free price quote! The 2017 Toyota Avalon is the most fuel-efficient version of Toyota’s flagship sedan. This year, it remains largely unchanged. In short, the Avalon Hybrid has the same styling as its gas-powered counterpart. The front-end features a narrow-slit grille with a large, multi-slat lower fascia. Chrome accents give it a more premium look. Standard features include LED headlights, turn-signal indicators at the side mirrors, a power moonroof, and 17-inch alloy wheels. HID headlights and LED daytime running lights are available as well. The Avalon Hybrid is powered by a standard 156-hp, 2.5-liter 4-cylinder and an electric motor mated to an electronically controlled continuously variable transmission (eCVT). Fuel economy for the Avalon Hybrid is an EPA-estimated 40/30 mpg city/highway. Inside, the Avalon Hybrid has a premium leather-trim interior. The center stack features the standard Entune multimedia system with a 7-inch touchscreen, navigation, Siri Eyes Free mode, Bluetooth connectivity for phone and audio, and a USB port. It can be upgraded with voice recognition, a Qi-wireless charging station, and a JBL premium audio system. Standard features include dual-zone automatic climate control, heated front seats, remote keyless entry, and push-button start. Tri-zone automatic climate control, heated rear seats, a leather-wrapped steering wheel, and a memory seat are also optional. The Avalon Hybrid comes with standard Toyota Safety Sense-P, which includes pre-collision system, pedestrian, lane departure warning, and adaptive cruise control. Blindspot monitoring and rear cross-traffic alert are optional. Also available is Safety Connect services (subscription required) which includes emergency notification, stolen vehicle locator, roadside assistance, and automatic collision notification.